On Sunday, February 7, while sailing to Port Canaveral, Florida, Anthem of the Seas experienced extreme wind and sea conditions, with wind speeds higher than what was forecasted. In an abundance of caution, the Captain asked all guests to stay in their stateroom until the weather improved. Four guests have reported minor injuries. The ship has sustained some damage to the public areas and guest staterooms, which in no way affect the sea-worthiness of the ship. Allure of the Seas will turn around and sail back to Cape Liberty, New Jersey. This decision was made due to weather forecasted for the next few days that is likely to impact the ship’s original itinerary. We are also sensitive to the fact that our guests have already been through an uncomfortable ride. Returning to Cape Liberty minimizes the risks of further bad weather affecting our guests’ voyage; we are optimistic that they will have a smooth sail home. We appreciate the patience and cooperation of our guests. We know it was tough day on Sunday and apologize for their discomfort. We also thank our captain and crew for guiding the ship safely back to better weather. Royal Caribbean International will provide each guest with full refund of the fare paid for their cruise. We will also provide each guest with a future cruise certificate for 50% of the cruise fare paid. The ship will arrive back at Cape Liberty on Wednesday. A Royal Caribbean cruise ship has been slightly damaged after a strong winter storm hit the ship on Sunday not far from Cape Hatteras in the Atlantic Ocean. The 168,888 gross ton Anthem of the Seas departed the Cape Liberty cruise port in Bayonne, New Jersey Saturday afternoon on a 7-night Bahamas cruise. A day later the large ship was caught in a horrific storm with Hurricane force winds. The ship was slightly damaged but still able to sail. The cruise line said 4 people had minor injuries. The weather conditions did improve and Anthem of the Seas continued on course for its first port of call at Port Canaveral, Florida but with a delay. The ship was scheduled to arrive at the port on February 8 but Royal Caribbean have now decided to cancel the sailing and return the ship to its homeport at Cape Liberty. #AnthemoftheSeas will turn around & sail back to Cape Liberty. This decision was made for guests’ comfort due to weather forecasts. Guests on the cruise will receive a full refund and a future cruise certificate with 50 percent of the fare paid. The cruise line did not want to impact the guests experience any further for the remaining itinerary. Royal Caribbean posted constant updates via its Corporate twitter account and apologized to guests. 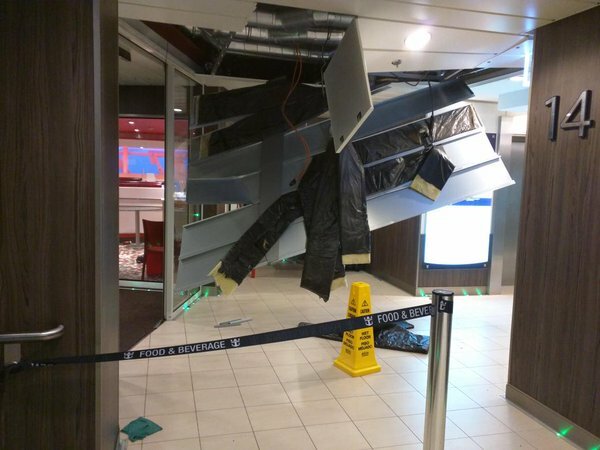 While Royal Caribbean’s newest ship is sailing back home the clean up has already started. Crew members can be seen sorting the damage out. No doubt all the different departments will have some extra work to do ready for the ship’s next voyage. The next cruise is scheduled to depart on February 13 on a 8-night Bahamas sailing.